Gin just speaks to some people. But, often it tells them that they can dance, that they’re really funny, or that they’re charismatic. And, what happens when people listen to gin? Ask this Personalised Gincident Highball glass! At first glance, this glass looks like an ordinary, if high quality, highball glass. It has a message printed on it defining the term ‘Gincident’, which is essentially a bad thing that happened due to the ginappropriate consumption of smiley juice! But, here comes the twist (of lemon)! Being customisable, you can add the name of the person who tends to have the most gincidents due to their gindecent relationship with good ol’ mother’s ruin! GINCIDENT [noun] /’gin-sa-dent’ An unfortunate event or occurrence due to the over consumption of gin by [name]. Don’t let gindecision get in the way… or maybe do? We don’t know if it’s a good or bad thing in this case. 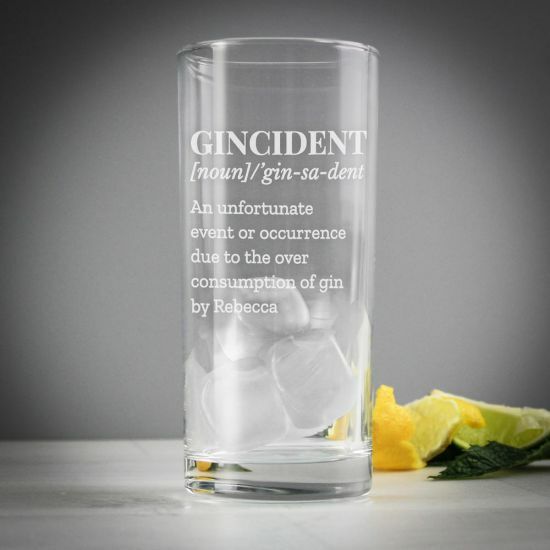 But we do know that if you’re a gin lover, or you happen to know one, you need this personalised Gincident Hi Ball glass! Are you gin or out?